Bearish reports on Galaxy S4 sales have eroded Samsung’s stock value in the last couple of weeks and now Samsung has stepped up to say those reports were not based on the reality. “I can say sales of the Galaxy S4 smartphone are fine. 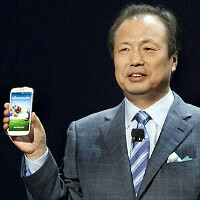 It’s been selling well,” Samsung’s JK Shin said for the Korean media. “The report (JPMorgan’s) was based on its own analysis. Probably, the bank may have corrected its previous bullish estimate about the S4 sales,” he added. It is rare for a company like Samsung to respond directly to a media report like this. Earlier, institutions like JP Morgan and Morgan Stanley both lowered their outlook on Samsung. This statement though shows that Samsung is definitely confident in sales of its flagship that reached a record 10 million sales within its first month of availability. Moreover, the Korean company said it has no plans to settle with Apple on any of the around 50 ongoing patent disputes spreading around 4 continents. Samsung also used the occasion to confirm it will indeed unveil its new Android-based Galaxy Camera 2 at an event taking place in London on June 20th. It is a problem when you flood the market with countless phones that has similar specs. Especially those midrange and lower end ones, do they even intend to support them software-wise for at least 2 years? It;s like lucky draw, A black box with 200 phones, draw one a week to be released as a new product. Most people don't know or care, I work for AT&T and we can't keep the Galaxy S4 in stock very long at all. Hey what about the htc one, does it sale like the s4. what company updates their midrange/lowrange phone better than samsung? Anyway it's the high end phones that matters the most, if you want updates buy high end samsung phones, same goes with other brands. When you go to a phone store, you dont see 200 different samsung phones, most you'll see is 4 different samsung phones. Which is not alot is it? So in the end, it doesnt matter how many phones samsung makes, since we wont see all of them at the store. "if you want updates buy high end samsung phones, same goes with other brands" No. At least not for Apple and Nokia. People r going to call me a fanboy again, but it's a fact that even lower end Nokia phones still get updates for at least 2 years. Apple is probably the best at supporting old devices, this coming from someone who doesnt like their products. You might be right, if you call Apple's bug-fixing , an update. Apple doesn't make many real updates. That's why all iDevices can have it. But if they do even small real update, the old models don't get it. That is hardware problem. See the iOS7 - only the last iDevices will have the full version. Can't speak for Nokia but Apple doesn't make anything but upper level phones. And as for them getting updated, they get stripped versions of the updates. What company other than Apple does that? Is anyone forcing you to buy all the phones ? if not then I dont see how is it a problem. stop trolling every samsung article. Exactly, I don't get why nokia fanboys feel more concerned about Samsung products. They have the money to release whatever they want. You don't like it then don't buy it! It's how business work! It'll be OK. All those people choosing Samsung doesn't make your choice any less valid. No need to be so insecure. Another one?!! Samsung staaaaaahhhhhp! Then again by them flooding the market they could bring down prices of phones due the already present competition leading to cheap phones for everyone!! stop. Just Stop. You are introducing a new device every week. What, you want 52 flagship level phones a year? Dafuq Samsung? haha judgement day is coming we will over run by galaxy T-100s.the're releasing so fast. the trolls lost their power...I'm all for it. I was willing to give a pass on the Fisher Price design of the S4 because of the impressive specs. However, the phones that I played with at Best Buy and T-Mobile were buggy and one model crashed a couple of times. I may buy the developer edition though. That phone should run like a Ferrari without all the added TouchWiz BS.